There are 51 reviews of Magie Noire. A bottle of Samhain, the festival that marks the beginning of winter, when the door to the underworld is ajar, and the fruits of the harvest are eaten with the dead. Children run around the countryside as night falls, dressed as ghosts and knocking on every door to "frighten" the household into giving sweets and nuts. Later, rowdy games are played and attempts at augury are made around the fire. It's wild and dark and intoxicating. Magie Noire is grown-up Hallowe'en; a cauldron of mysterious potions, tarry, sweet and bitter, stirred by a terrifying witch. Not for the faint-hearted, and not for daylight. Took a couple of spritzes of "Black Magic"on the arm. Soft memories of Incense of the 70's. Myrrh purr purr. The latest EDT is quite enjoyable as it lacks the Low-Fat Hi Sugar content of most of the Standard Feminines on the shelf and presents a neutral Floral. I was too young to wear this when it first came out, so my first experience with Magie Noire came last month with an Ebay sample that was annoyingly unmarked. Perhaps unsurprisingly, I became infatuated with my sample and had to have a full bottle. After some rather costly experimentation, I discovered that the version I fell in love with is the vintage Huile. For me, this is the concentration/version that is genuinely magical. The top notes produce the exact smell of a green, unshelled walnut when you run your fingernail across its skin. It then becomes a deeper, spicier, more mysterious scent involving patchouli, oak moss and civet. Beautiful and quite unlike anything else! I'm not quite as much a fan of the vintage parfum. For me, it is missing that amazing green top that makes me want to sink my teeth into something. It's a bit too bottom-heavy for me, although I appreciate its deep and strange exoticism. This fragrance has undergone several reformulations over the years, and not for the best. However, it seems that the EDT has now been restored to something closely approximating the original: a bottle I recently purchased at TJMaxx smells wonderful, almost indistinguishable from my vintage EDT. To me, Magie Noire smells like a cross between Bandit and Azuree - you might not need Magie Noire if you have one or the other of those, but it can't hurt! This is a reasonably priced chypre with excellent longevity and sillage. I may be alone here, but in Magie Noire I smell a sister to Caron's wonderful Yatagan. There is the same vegetal quality (which I generally do not like) that evokes decomposing pine needles in Yatagan although it is handled very differently in Magie Noire. Both go completely against the grain of current trends and are all the more compelling for it. Far and away the best scent that Lancome has ever produced, it has all the mysticism of an oriental but is really a chypre, festooned with fruits, flowers and honey and with a serious line up of basenotes: Patchouli, Castoreum, Civet, Vetiver, Musk, Oakmoss and Benzoin. While it is totally unlike Sortilege, they both do share a bewitching quality and are both aptly named. 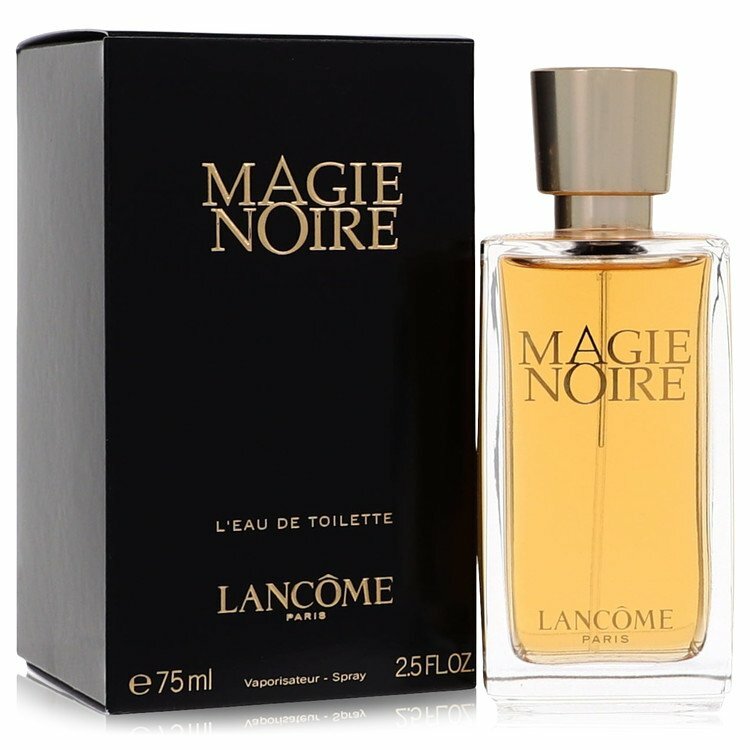 Lancome Magie Noire Eau de Toilette Natural Spray, 2.5 Fl. Oz. New bottle for Lancôme's Magie Noire.